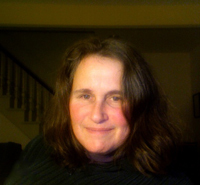 Please welcome author friend Jolina Petersheim to my blog! This is her second visit; not quite a year ago, she was here with a Q&A about her debut novel The Outcast. 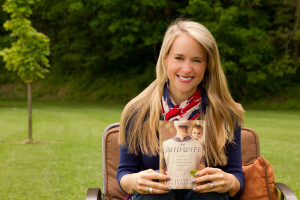 Today she returns with a Q&A about her second book The Midwife. Jolina was one of the first bloggers who reached out to me when I joined Twitter—over three years ago—and she remains one of my closest blogger friends. I’m so happy to congratulate her on The Midwife, a fascinating book that absolutely captivated me. What I love most about Jolina’s books is that they pull me into wonderfully engaging new worlds. Thank you for taking the time to visit my blog for the second time, Jolina, and congratulations on your second book baby! At the end of this Q&A you’ll have a chance to enter a Rafflecopter for a chance to win a copy of one of Jolina’s books, a Starbucks gift card, or an Amish wall hanging! I read that you got the idea for The Midwife after a friend considered using a gestational surrogate. In the course of writing the book did you talk to surrogates or parents who used surrogates? What types of research did you do before and while writing this book? Was there anything that surprised you about surrogacy or swayed your own opinions about it? I didn’t talk to parents who used surrogates or to surrogates themselves, but I did discover an online surrogacy forum early in the research of The Midwife that just transformed everything, providing me with a range of valuable information at the click of the mouse (which was very convenient since I had a newborn at the time). I didn’t realize, for instance, that a surrogate has to have carried a child to full-term and had a natural birth to qualify for surrogacy. This threw me off at first, because I wasn’t anticipating for Beth Winslow—the surrogate in The Midwife—to have lost a child through adoption when she was in college. However, as Beth’s backstory started to reveal itself to me, I realized that this loss of a previous child is one of the main reasons she refuses to lose the child in her womb when the biological parents of the surrogacy learn there might be a genetic abnormality and attempt to coerce Beth into terminating the pregnancy, which she refuses to do and instead runs and hides in an Old Order Mennonite home for unwed mothers called Hopen Haus. You balance writing with motherhood—what advice would you give to a woman about to embark on a career in writing combined with motherhood? What has worked particularly well for you? What has been the most challenging? Give yourself time! I wrote The Outcast (my first book) in six months—working up to eight hours a day because I had an agent’s interest but no official contract, and also because I knew I had a narrow window of time until my daughter was born. After her birth, however, I signed a two-book contract with my publisher. While talking about the timeline for my next book, I asked for a year instead of six months, and they kindly agreed. Trying to find my footing as a debut author and as a debut mom was a little challenging for a while, but with my husband’s and family’s help, it all worked out. I found that taking an afternoon to write at the library or at the coffee shop really strengthened my focus and gave me renewed zest for the story. And now, looking back, I see that having a creative outlet to pour myself into during my daughter’s difficult period of sleep deprivation was such a blessing to me. I would do it all over again! What inspires you as a writer and keeps you writing? Follow on: how do you keep track of your writing ideas? Do you keep a daily journal or notebook? Books inspire me! I keep one next to the bathtub, one next to the bed, one in the diaper bag and/or my purse. Since my daughter’s birth two years ago, I haven’t had quite as much time to read, but I’ve made up for that by listening to audiobooks in the car or while I’m cooking. Hearing the story rather than reading it is almost more rewarding, in a way, as so many of the performers put their entire heart into the work (like the wonderful narrator, Tavia Gilbert, in The Outcast and The Midwife; I love working with her!). If I’m ever having a dry time creatively, taking a day or two to read or listen to a quality piece of literature refreshes me like nothing else. For instance, I read The Orchardist while I was working on the first draft of The Midwife, and those lyrical passages reminded me that writing is an art form, and we should give it the respect and time that it deserves. As for recording ideas: I kept a journal from the time I could write until I got married, but six months after I married my husband, I started blogging and drafting my first novel (the latter which shall never see the light of day!). So, rather than using my spare time to record our life in my journal, I used the spare time to work on my story. This pattern has continued to this day. I used to think that finding a story idea must be the most difficult aspect of writing, but now that I’ve trained myself, I can see the ideas everywhere. Now I realize the difficult aspect is turning ideas into story! Do you follow a certain daily ritual and/or schedule? Do you write at the same time every day? Are there things that have to be the same in order for you to write, e.g., a lucky coffee cup or other token you always need to have with you? How did these things change or remain the same after you had a child? My husband teases me and says I’m one of the most routine-oriented creatures he’s ever known. Indeed, I do get a little flustered when something throws my day off, and I’ve had to acquire more flexibility after giving birth to my daughter, because newborns and toddlers have a schedule all their own! However, usually I try to write in the morning from 6 until 8. My husband, at 7, gets our daughter up and gives her breakfast before he leaves for work. I respond to emails and do a little social media by sitting on the tiled floor during my daughter’s bath time (she would stay in there until her fingers and toes are pickled! ), and then – during her nap – I work for two more hours. Rarely do I work more than four hours a day, even on deadline. It just doesn’t seem to work out with my family’s schedule. Still, I’ve found that slow and steady does win the race, so I just plod away a little bit each weekday (saving blogging and guest posts for weekends), and at the end of the year, I usually have a manuscript. I don’t have any special place that I write, though in the winter I do gravitate toward a comfy chair in the living room with a footstool (sometimes, if cajoled, my husband will build a fire in the fireplace). The other seasons, I like to write outside on the front porch that has a panoramic view of our field and the surrounding mountains. This past week, the farmers baled our hay, and it was so beautiful to watch the gold pieces rising into the air and the grasshoppers springing across the field. Before my daughter’s birth, I used to write up to eight hours on weekdays, so that has certainly changed, but I have definitely found a routine that I love now and that works for everyone. Come September, though, when our other baby is due, I know that this routine is going to change. By the time I’m eighty, I’m really going to have this flexibility thing down pat! I really liked the name Ernest Looper, and I’m fascinated by the name Rhoda Mummau—and I’m wondering if there’s significance to these name or other names in the book? Do you choose based on just “what you like” or is there a method to the naming? Earnest Looper was actually a road sign we passed one afternoon, and I liked the sound of it and just changed the spelling a little. Rhoda seemed, to me, like the name of someone you wouldn’t want to trifle with—which Rhoda closes herself off to the pregnant, unwed girls in her midwifery care, although she is ministering to them in such intimate ways—so it fit. Mummau was actually the last name of my great grandmother, Verna. I like to choose names that I am familiar with in some capacity because I think they ring true. I have a nonfiction book on my shelf called The David and Anna Miller story, which records the names of everyone in my Mennonite heritage, back to the 18th century. I like to sort through the names and rearrange a first and last name until I find one that I enjoy. For instance, I found the name Leona Ebersole—the main character in my next book—by using this method. 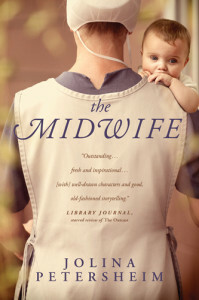 Sometimes during my writing, I find one character in the book that I can identify most closely with—was there a character in The Midwife you felt most similar to? If so, why? Though Beth Winslow, the surrogate in The Midwife, is an introvert and I’m about as extroverted as a golden retriever, I really found myself relating to her journey of learning to overcome fear with faith. Because she has lost a child in the past, she holds on to the child she’s carrying as a surrogate with an even greater fervency. When her worst fear comes true, and she is unable to get the child back from her biological parents because they share no genetic connection, she must walk through a journey of healing and self-discovery. I was in the editorial process of The Midwife when my husband and I miscarried a child at ten weeks, and suddenly I found that Beth’s journey of healing and self-discovery was my own. It was such an incredibly powerful time for me—rereading the scenes that my own fingers had typed before our family’s loss and seeing how God had orchestrated those scenes to later minister to my soul. I believe the redemption I experienced during the editorial process is conveyed in the midwife’s story, as it is not just the midwife’s story, it is also my own. When I interviewed you for your last book The Outcast, I asked if you had actors in mind who might play the characters in a movie or in a reader’s mind. I’ll ask the same for this book… what actors might play the lead characters in this book? I love this question! Again, I had so much fun with it that I created a Pinterest board with the characters. I would share the names of the actors I’ve chosen, but I believe you have to see them in the poses that I’ve selected to get an idea about what kind of character I imagine. Thanks for having me here, Julia; what an incredible honor to visit with you! The honor is all mine, Jolina! Thank you so much for being a return visitor to my blog! You can connect with Jolina on Twitter, on Facebook, and on Goodreads. And don’t forget to enter the Rafflecopter for a chance to win one of her wonderful novels. Look forward to reading this book. I had two at home births with a dear midwife and also experienced loosing a child 5 months into pregnancy. I am inspired by your routine for writing in the midst of being a mother. Very challenging. Congratulations on your success. Curious, which writers have been your biggest catalysts? Dearest, Gloria, I’m so sorry to read about the loss of your sweet baby. I was only 10 weeks along when I miscarried, and I know that with every week that passes, we become even more deeply attached. Also, I admire you so much for giving birth at home! I haven’t had a home birth yet, but that is one of my ultimate dreams. I tried giving birth at a birthing center, but I didn’t process quickly enough and had to be moved to the hospital. And, yes! Writing in the midst of motherhood is indeed challenging at times, but the rewards are great! Barbara Kingsolver is one of my main role models–just because she continues to churn out such quality work while also living such a fulfilled life. I think she has the perfect balance of almost everything. I remember sitting on the couch during one of my daughter’s many, many feeding on demand sessions and reading an essay that Kingsolver wrote about typing one handed around her nursing child. It was so inspiring to me! I thoroughly enjoyed reading this post and learning about the ins-and-outs of your writing routine. Thank you, Laurie! Such a pleasure to meet you here on Julia’s wonderful blog. Love, love, LOVE how you selected the names! I couldn’t agree more what you said about audiobooks, Jolina. It’s such a completely different experience, one I’m starting to appreciate now more than ever. Writing outside on your porch with a view of the mountains and the field and the grasshoppers sounds absolutely blissful. I’m so very happy for you that you get to enjoy such a beautiful life (that you’ve created!). Thank you Jolina for sharing this, I was very inspired by your writing routine, since I feel it resembles my own or the one I am trying to establish 🙂 Also inspiring to read about your challenges with life and writing and how these can intertwine to help us overcome difficulties. I also lost a child in miscarriage and it certainly helps to write going through the emotions of loss. Your books sound amazing and I will see if I can manage to get hold of your work here in Jakarta. Thanks again, both Jolina and Julia. Hello, Lene, I’m so sorry to hear about your loss, but you are absolutely right: writing through those emotions helps us to better understand them and also better understand ourselves. Keep writing and working toward that routine. I’m certainly off of my routine since I’m on vacation, but this break is nice, too. I’ll be getting back into the swing of things hopefully by the end of the week. I’ll be thinking of you in Jakarta! What a great interview! I love every question, they are exactly what I wanted to know!!! I just put down the book at the end of Part 1 and it is riveting. Jolina, you are the kind of author that makes your readers love each other simply because they share a common empathy for your character! Poor, poor girl weeping into the shoulder of a sympathetic stranger! This book is so powerful…and I just started it! I’m so glad you are doing this! God is using you and I love how seriously you take this calling. No silly, gushy sap here. This is powerful stuff. God bless you and your sweet fam! Thank you, Rebekah; I appreciate your precious support very, very much! Love you!